(NaturalNews) A bombshell study published in the medical journal The Lancet admits what Natural News and others in the holistic health community have been reporting for years: antidepressants kill. On Wednesday, researchers published the most comprehensive analysis to date of the safety and efficacy of widely prescribed antidepressants in children and teens. What they found is that the majority of antidepressants prescribed to young people have far more risks than benefits, doing essentially nothing to ease symptoms of depression, while significantly increasing suicidal thoughts and suicide attempts, CBS News is reporting. Out of 14 antidepressants analyzed by researchers, only one – fluoxetine (marketed under the name Prozac and Sarafem) – proved effective for relieving symptoms of depression better than a placebo pill. Venlafaxine (Effexor), on the other hand, was shown to increase the risk of suicidal tendencies in children and teens compared to a placebo and five other antidepressants. The study results are major considering the fact that antidepressant use among young people is at an all-time high. Shockingly, children under 5-years-old are the fastest growing group being prescribed mind-altering drugs. Antidepressant use among children and teens rose from 1.3 to 1.6 percent between 2005 and 2012, according to a separate study published in The Lancet. As the authors of this latest study confirm, the implications of drugging children with powerful, mind-altering drugs is completely unpredictable, which is why international guidelines encourage doctors to use non-drug approaches including "cognitive behavioral or interpersonal therapy." Lead study author Dr. Andrea Cipriani says that because brains in children and teens are not yet developed, it's important to lead with caution when prescribing medication, "because we don't know the potential implications in the long term ... ."
The U.S National Institutes of Health estimates that some 2.8 million children (or about 11 percent) between the ages of 12 and 17 have suffered from at least one episode of depression, for which we now know that antidepressant drugs are totally worthless. Dr. Cipriani explains that depression in children differs widely from that of adults. "Not only is it still under-diagnosed and under-treated but also it tends to present in a different way," he said. "Depressive symptoms in children and adolescents are rather undifferentiated. You notice more irritability, aggressive behavior and problems at school. And consequences of depressive episodes in children and adolescents are dramatic because they include impairments in their social functioning but also an increased risk of suicidal ideation and attempts." 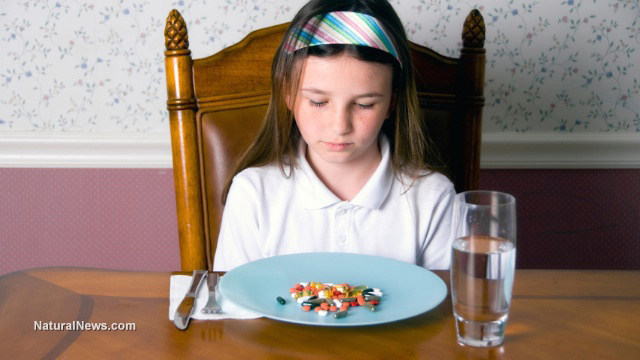 The U.S. Food and Drug Administration has known for more than a decade that antidepressants pose immense harm to patients, particularly children, which is why it implemented "black box" warnings in 2004 for users under the age of 24. The labels clearly state that the drugs up your chances of becoming suicidal or intensify preexisting suicidal thoughts and behavior. Yet, irresponsible physicians continue to push harmful drugs on children and teens that alter brain chemistry. Not only that, but doctors are increasingly prescribing the drugs for off-label uses. This was substantiated just weeks ago in a study published in the May issue of the Journal of the American Medical Association (JAMA), which found that nearly half of people prescribed antidepressants aren't even depressed. After analyzing a decade of antidepressant prescription records, researchers concluded that only 55 percent were given for depression, while the remaining 45 percent was written for conditions such as anxiety, sleeping problems, pain, panic disorders and attention deficit hyperactivity disorder (ADHD). Other off-label uses include digestive problems, eating disorders, migraines and menopausal symptoms. Twenty-nine percent of antidepressant prescriptions were written for off-label uses. The study authors expressed grave concerns about the fact that these drugs, which are proven to be dangerous, are being prescribed for conditions for which there is no evidence supporting their efficacy, or safety for that matter. The reason doctors are pushing unproven drugs, is because they're being advised to do so by Big Pharma, and not by scientific research, said the study authors. Further illustrating just how worthless these drugs are, medical researcher Peter Gotzsche said last year that nearly all psychiatric drugs, including antidepressants, could be withdrawn from the market without damaging public health. In fact, he recommends it.